Scrooge and his nephews, presumably waving farewell to the change in your pockets. This morning Lego officially revealed the next themed line of its blind-bagged collectible minifigures, and it’s a celebration of beloved Disney icons that you can use to fill out that incredibly expensive Disney World castle set you impulse bought a few years ago. This isn’t actually the first time a wave of the minifigures series has been Disney themed, of course—a set of minifigures back in 2016 heralded the arrival of the aforementioned castle set, and this follow up is in many ways a continuation of that wave. 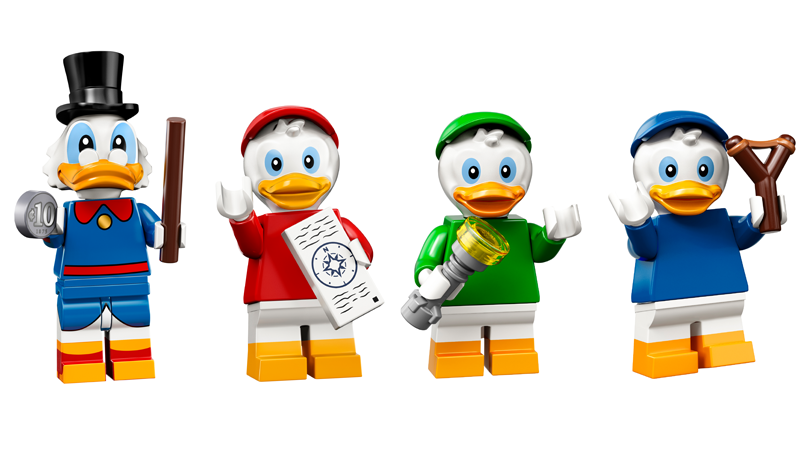 Want a Scrooge and his nephews to go with that old Donald? Here you are. Want an Edna Mode and Frozone to go with Mister Incredible, or a Jasmine and Jafar to go with Aladdin? They’re here too! There are even versions of the vintage Mickey and Minnie being released in the new Lego Ideas Steamboat Willie set that you can find to pair with their more colorful counterparts from the first line. But there are also plenty of new and exciting additions in this set of 18 that aren’t necessarily pairings to go with the prior releases—from Hercules and Hades, to Frozen’s Elsa and Anna, and, perhaps most delightfully of all, Jack Skellington and Sally from The Nightmare Before Christmas. This is the first time some of these characters are being brought to life in Lego form, and they all look spectacular—from their included accessories to even the alternate faces on the human characters, each one is a delight. Which, frankly, makes it that much harder to just pick up the ones you really want. They all look so good together! Curse you, Lego. You’ll be able to start cursing them (and handing over your cash) for these Disney minifigures from May 1, when they go on sale for $3.99 per blind bag.